My vegetable garden at its peak a few years ago. By golly, it finally clicked for me what the value of a site like Pinterest is. Like many others, I received an invitation to join Pinterest, dutifully signed up and then timidly "pinned" a few items on a board. I wasn't sure what I was doing and I wasn't sure if this was going to turn into a giant rabbit hole, sucking in the last few precious minutes of the day. I looked at the site occasionally, but still couldn't decide how it would be useful to me. What value was there in sharing images? And what about those concerns that pinning images of others might violate copyrights? First, I read several articles about the founder, Ben Silbermann, and his vision for Pinterest. I read about how he used to collect insects and pin them to a board to display them. I also read that Pinterest gained a lot of momentum when he shared it with interior designers, who immediately took to it to pin up boards of decorating ideas. Second, the boards around the raised beds in my vegetable garden had been slowing rotting over the years and were no longer holding in the dirt, so I had a crew tear them out last year and haul the rotted wood away, leaving me with a blank slate. I proceeded to plant the vegetable garden without the raised beds, primarily because I didn't have time to build new frames but partly because I couldn't decide what to frame them with. Wood again? Brick? Stone? Nothing at all? Third, and finally, I walked out to my vegetable garden yesterday morning and found it overrun with deadnettle. Oh, the horror. I immediately decided that I need to re-install the raised beds, and do it soon. But this time, I've decided I'm going to do it with something more permanent than the wood I used before. In ten more years, when I am ten years older, I don't want to be faced with re-doing them again. And that's when the "click" came regarding Pinterest. I need a place to collect ideas for my new raised bed vegetable garden to share with others who are going to help me build it. Why not do it on a site that is built to share images? I've created a new board on Pinterest called "Vegetable Garden" and started pinning. I'm starting to search through Pinterest to find images of vegetable gardens that I like and re-pinning them to my board. I'm searching the web, too, but that is slow going. I could use some help, your help. 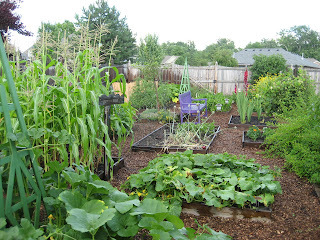 If you know of an image online or already on Pinterest of a pretty, cool, neat-o vegetable garden, let me know. I can pin it to my board and see if it fits with my overall vision. Pinterest. It turns out to be a little bit of a rabbit hole, but a very useful one for someone who is re-doing her vegetable garden, all over again. I've found Pinterest to be such a great place to keep my garden ideas together -- we moved into a new house this year and the entire yard is a blank slate. I found it all a bit overwhelming and had trouble visualizing what might work in each zone -- Pinterest to the rescue! I've got my garden boards at pinterest.com/charlotte/gardens and pinterest.com/charlotte/landscaping_ideas and I can't wait to see what you pin for the vegetable garden. I need to get mine started and need some... pinspiration? I haven't ventured into that rabbit hole. Best of luck on your veggie garden. CAn't wait to see what you do. I've been using Pinterest a little bit. Not so much the social aspect of looking at what other people pinned, but as a personal bulletin board. I don't know if you get notified when people pin photos from your blog, but I pinned your "Green Arrow" label from yesterday's post, to remind me to look for that variety of peas. But I'm not really expecting anyone else to look at the photo of a plant tag and say, "That must be a variety of pea. I should give it a try, too." I'm a big Pinterest fan as well, though I mostly use it to collect art ideas. My current garden boards have mostly to do with garden sheds and greenhouses, as well as fairy gardens - since I am presenting a program next September on the subject and need some ideas. I've been using pinterest as a good place to keep track of ideas, too. One thing I like about it is that, unlike facebook or twitter, you do not feel compelled (at least I don't) to go there every day. It's the less social form of social media -- great for introverts like me. I love pinterest for the very same reason. I love the inspiration I'm getting out there. Funny, I am also build a raised bed vegetable garden this year. I have pinned a few on my garden ideas board, but not much yet. I'm going to check out your pins and follow you there. I have yet to pin although I do spend quite a bit of time looking at other people's boards...you have some very unique veggie beds pinned. I think I came too late to the party - I tried to get onto pintrest and they said they now have a waiting list.... anyway I use cedar blocks along the side of my vegetable bed and they have worked very well - you can fill the holes with plants - I have aloe vera and garlic chives in mine as they are not at all fussy. http://africanaussie.blogspot.com.au/search/label/vegetable%20garden. They take up a bit of room, but never need to be replaced which is nice. Your vegetable garden board is lovely! I've not ventured into Pinterest myself but you have made me interested. Thanks. Oh, I love pinning ideas for my future gardens. If I can accomplish even a tenth of the ideas that I've pinned my garden will be amazing! I followed your board too, you've got some really great things pinned! Am pinning on a semi-regular basis! I'm here from Dirt Therapy. I love your raised beds and would like to see what you come up with. I've got a few raised beds but I seem to be growing more mushrooms than veggies. That really wasn't the plan. Keep pinning! I think of it as having cut the photos out of all my favorite magazines instead of saving the whole thing!!! Year after year!! !